Very Very Vicky: Worth the Wait! Can't wait another minute--I've gotta show you how the Coral Cottage front bedroom looks in all her glory! Remember my recent post where I asked you "What's Behind Door Number Two" and showed you the BEFORE? Today here is what is behind door number two...welcome in. Over the bed we hung the wonderful art project made from a window recycled from The Coral Cottage. I blogged about it in this post. 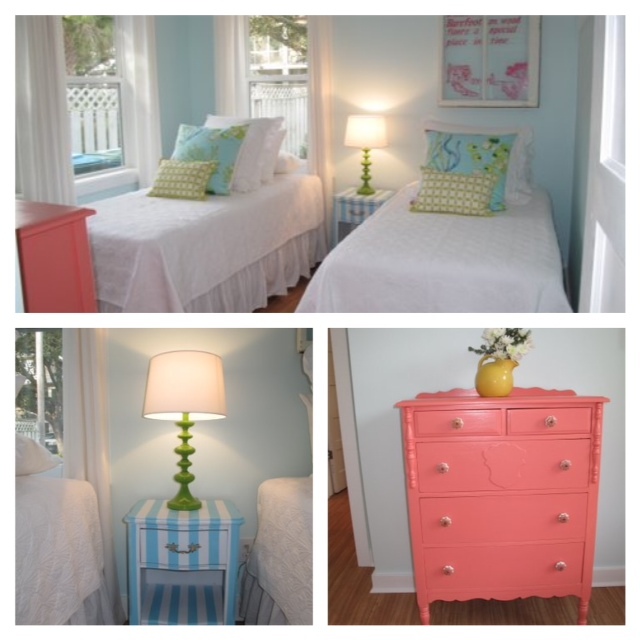 This montage of photos shows the placement of the repainted dresser that I salvaged and had painted with coral paint as well as the nightstand that was a flea market find. The Coral Cottage is ready for guests and Jim Heflin at Tybeecottages.com is taking reservations. We'd love to have you if you're in need of some Tybee Time! More than lovely Vicky!!! I've enjoyed watching your project grow & become a true coral cottage!! Thanks Becky--you're such an encourager! It's beautiful, Vicky! The colours are all so perfect and cottagey. We had some "Tybee time" in October, but could use more after having -40deg. temps last week and 8" of snow yesterday! Perfecto!! so light and airy and cheerful!! and I just gotta know......did you paint the lil table blue first and then tape to paint the stripes white? or did you do white first and then blue? I've got to make these ..... so cute!! On this particular table I purchased it already painted. If I were going to paint it I would probably paint it white and then stripe it blue. Beautiful! Tom and I are both so impressed. Hard to believe it's the same space! Love,Love,Love it..quilts with seashells..stripey table..coral dresser..Beach house window art..just so calming and cool..more than good job.. Thanks Janet! So glad you like it!